PDF is short for Portable Document Format File, which is very popular among the users. 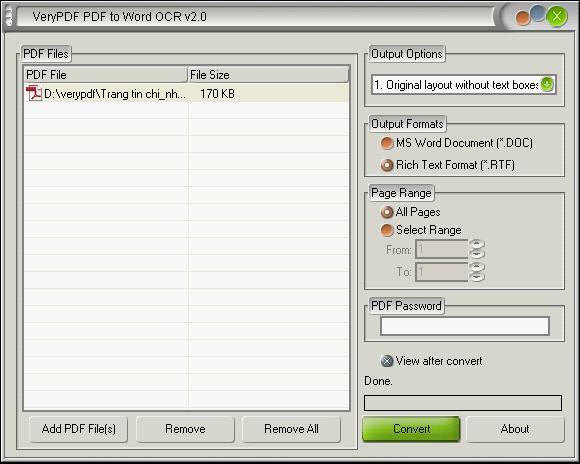 However, in some case, we only need some RTF files, and the question is how to convert PDF to RTF quickly, then PDF to DOC OCR Converter could help you with these kinds of issues, which could convert PDF to editable RTF with different languages flexibly. To download this powerful tool, please click here , to buy single personal user license, click Single Personal User License ,to buy single commercial user license, click Single Commercial User License , to buy 2-5 personal user license, please click 2-5 Personal User License or 2-5 Commercial User License ,and to purchase site license, please click Site License .